According to the World Meteorological Organization (WMO) the rate of increase of CO2 recorded in earth's atmosphere in 2016 was up 50 % on that of last ten-year average. Research stations located in 51 countries returned measurements of concentrations of carbon dioxide and other 'warming gases' such as methane and nitrous oxide, showing a dramatic rise. Researchers ascribe the increase to a combination of human activity and the El Niño weather phenomenon. The BBC reports scientists fear this rise will make global temperature targets 'largely unattainable." 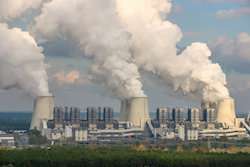 The figures published by the WMO indicate the levels after significant amounts of the CO2 had been absorbed by the Earth's "sinks," which include the oceans and the biosphere. 2016 saw average concentrations of CO2 hit 403.3 parts per million, up from 400ppm in 2015. The climate observatory Climate Central explains, '(…) studies show a wide date range from between 800 000 to 15 million years ago. The most direct evidence comes from tiny bubbles of ancient air trapped in the vast ice sheets of Antarctica. By drilling for ice cores and analysing the air bubbles, scientists have found that, at no point during at least the past 800 000 years have atmospheric CO2 levels been as high as they are now." The BBC quotes Dr Oksana Tarasova, chief of WMO's global atmosphere watch programme, "It is the largest increase we have ever seen in the 30 years we have had this network." A previous spike was recorded in 1997-1998 during a previous El Niño, when, 'it was 2.7ppm and now it is 3.3ppm, it is also 50% higher than the average of the last ten years." El Niño causes levels to rise as the droughts that follow in its wake limit the uptake of CO2 by trees and plants. While emissions from human activity have come down, Dr Tarasova explains that it is the cumulative emissions that are showing in the figures, since CO2 remains aloft and active for centuries. Rapidly increasing atmospheric levels of CO2 and other gases have the potential, according to the study to, "initiate unpredictable changes in the climate system... leading to severe ecological and economic disruptions." The study states that since 1990 there has been a 40 % increase in total radiative forcing, that's the warming effect on our climate of all greenhouse gases. The last time the Earth experienced a comparable concentration of CO2 was three to five million years ago, in the mid-Pliocene era. The climate then was 2-3C warmer, and sea levels were 10-20m higher due to the melting of Greenland and the West Antarctic ice sheets. Speaking to the BBC, Prof Euan Nisbet from Royal Holloway University of London says, "The 3ppm CO2 growth rate in 2015 and 2016 is extreme – double the growth rate in the 1990-2000 decade. "It is urgent that we follow the Paris agreement and switch rapidly away from fossil fuels: there are signs this is beginning to happen, but so far the air is not yet recording the change." Methane levels are also on the rise – levels were larger than the ten-year average. Prof Nisbet says there is a fear of a vicious cycle, where methane drives up temperatures which in turn releases more methane from natural sources. "The rapid increase in methane since 2007, especially in 2014, 2015, and 2016, is different. This was not expected in the Paris agreement. Methane growth is strongest in the tropics and sub-tropics. The carbon isotopes in the methane show that growth is not being driven by fossil fuels. We do not understand why methane is rising. It may be a climate change feedback. It is very worrying." WMO Secretary-General Petteri Taalas has said that without rapid cuts in CO2 and other greenhouse emissions we will be heading for dangerous temperature increases by the end of this century. Why was it warmer 120,000 years ago? Only human beings could respond to the threat of increasing CO2 emissions by emitting *more*. It's possible deserve what we get. Agree to most of the facts quoted in the article except the Picture. The picture is not right, it shows the image of Natural Draft Cooling towers which does not give out carbon dioxide or harmful gases. It is just plain water vapor mixed with air, in layman`s language these are clouds.